Although Washington had just returned to the National Association after a year’s absence, it was thought that a game with the Nationals would provide more of a match than one played against a local Richmond team. As the Dispatch indicated in its day-of-contest edition, “It is possible that a picked nine of this city will be induced to play the Red Stockings a game, though they can scarcely do so with the hope of success.”2 Notwithstanding the newspaper’s realistic assessment of its local talent, it appeared to be genuinely misinformed with regard to the skill of the Washington squad which it reported “have lately increased their numbers by the addition of some of the most proficient players in the country.”3 This was news to those who more closely followed the fortunes of professional baseball. The nucleus of Washington’s team resided in three position players: outfielders John Hollingshead and Art Allison (neither of whom had played professionally in 1874), and second baseman Steve Brady, who had only 27 games’ experience in 1874; and the pitcher, Bill Stearns, whose professional record of 12 wins and 50 losses over the previous four years did not appear to evidence a high level of proficiency. In fact, the Boston Advertiser considered only two of Washington’s players to be of major-league caliber.4 The game was to be the second of the series between the Red Stockings and Nationals, the former having won the first on April 26 by a score of 8-2. Accordingly, the Daily Dispatch felt the game would be of “decided interest.”5 The turnout seemed to confirm that sentiment. The match had been arranged by a local promoter, A.B. Sturgis, who guaranteed a minimum return to the teams regardless of attendance.6 Richmond was not, however, the baseball hub it had been a decade before.7 Thus, the crowd of spectators was surprisingly large. The weather cooperated. It was clear, mild, and pleasant with brisk southerly winds and temperatures in the mid-60s.8 This was a far cry from what the Boston team could have expected had it instead scheduled its games for its home grounds for this weekend. As reported in the Daily Dispatch, “Fifteen hundred persons paid their way through the gates. … at least five hundred men of economical and enterprising turn of mind clambered over the fence, and thus ‘dead-headed’9 themselves in,” and “a goodly number of ladies were present.” As if the press of people was not sufficiently problematic, the roadways of the grounds were “pretty well lined with hacks and other vehicles.”10 Railcars did not run from the city to the grounds as had previously been the case. This was because of a city ordinance passed in 1873 prohibiting any steam-propelled vehicle of any kind of the Richmond, Fredericksburg and Potomac Railroad Company from traversing Broad Street, the most important and populous street of Richmond.11 Thus, the relief from vehicular traffic that railroads afforded in other major cities where baseball was played was not available in Richmond for this game. Boston’s battery, Al Spalding and Deacon White, each collected four hits, while Hollingshead and John Dailey led Washington with two hits apiece. Spalding and Jack Manning each collected a three-base hit for Boston as did Washington’s Hollingshead. The result — a 22-5 Red Stockings victory — was probably more one-sided than the locals had expected, with the game all but decided by the end of the second inning, during which Boston scored 12 runs. In any event, baseball experienced a rebirth in Richmond in 1875.18 Whether this was an effect of the professionals coming to Virginia as claimed by the Clipper19 or simply the fact that events that had plagued the city and its economy from 1867 to 1874 had finally abated sufficiently to allow the game to prosper as it had in 1866 and 1867 are matters of debate.20 In either case, the Red Stockings had come to town and shown the locals how the game could be played and enthusiasm for baseball in the Richmond area was rekindled. 1 “The Champions in Virginia — Boston vs. Washington,” New York Clipper, May 8, 1875. The Clipper called it "the first professional championship match ever played in the South." 2 Corroboration of that fact came within a very short period of time. The newly organized Pacific Club of Richmond won most of its games in July 1875, and gained a reputation as one of the city’s finest clubs. The Washington Nationals, with a record of 5 wins and 23 losses in professional championship games through July 4, 1875, invited the Pacific Club to Washington for a game. The Pacifics lost 22-5. Clearly, the Richmond baseball clubs were not yet a match for even a second-tier professional nine. Ryan Swanson, When Baseball Went White — Reconstruction, Reconciliation & Dreams of a National Pastime (Lincoln: University of Nebraska Press, 2014), 166. 3 Richmond Daily Dispatch, April 28, 1875. 4 William Ryczek, Blackguards and Red Stockings: A History of Baseball’s National Association, 1871-1875 (Jefferson, North Carolina: McFarland, 1992), 181. 5 Richmond Daily Dispatch, April 28, 1875. This was not a foregone conclusion, however, as baseball had been on the wane in Richmond since 1867. Swanson, 128. 7 Baseball flourished in Richmond in 1866. Although no team played more than 10 games, at least 30 clubs played in the city during the 1866 season. See Swanson, 30. In August 1867 the city council voted to limit baseball activity on the Old Fair Grounds, and beginning in 1868 and continuing into early 1875, baseball games declined by nearly 75 percent from their 1867 levels. Swanson, 128, 165. In that context, the turnout was quite unexpected. 8 “Local Matters — The Base Ball Match Yesterday — The Red Stockings Victorious,” Richmond Daily Dispatch, April 30, 1875. 9 Viewed the game for free. 10 Richmond Daily Dispatch, April 30, 1875. 12 Richmond Daily Dispatch, April 30, 1875. 15 Ibid. 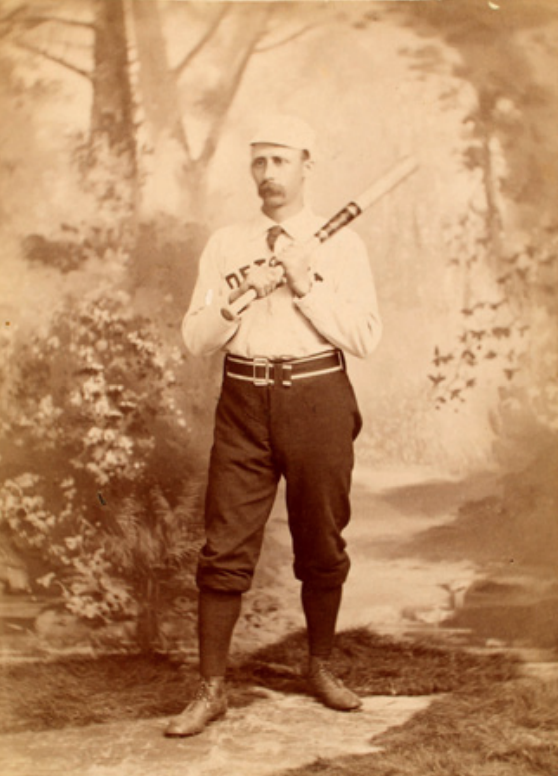 The umpire was actually Tommy Beals of the Boston team, who umpired eight games during the course of his playing days, the April 29 game being the first of five in 1875. 16 New York Clipper, May 8, 1875. 17 See Swanson, 168 for one explanation of the Northern prejudices and expectations buried in the Clipper’s own seeming intemperance. 19 “The effect of the visit of the professionals to Virginia was the organization of a new club in Richmond, called the Pacific Club, by a number of young gentlemen residents of Broad street, on Thursday evening, April 29.” New York Clipper, May 8, 1875. 20 The 1867 commercial lease of the Old Fair Grounds, continual Reconstruction trials, poverty, racial tensions, the flood of 1870, and the Panic of 1873, with its impact on the railroads and banks, were all adversities that made the playing of baseball a more difficult challenge in Richmond than in other parts of the country during this period. Swanson 128, 158.